The DH-40 Series was the first model of the Pillar Disc Drill that was released. It is a 3 plex toolbar with parallel lifting sub frames to raise and lower the double shoot Disc/Hoe openers. The main toolbar does not move to lift the openers out of the ground. The 40′ toolbars can be set up with 10 or 12″ spacing. 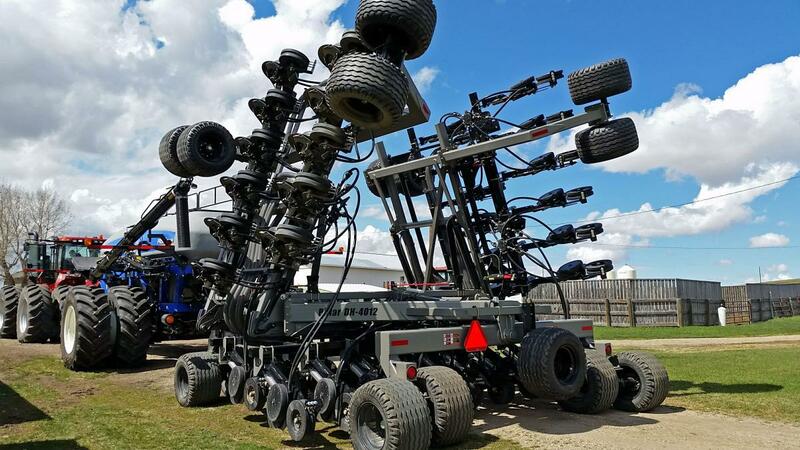 With depth stops on the cylinders it is very easy maintain the correct frame height as the disc wears or when changing seeding depth. The DH-40 Series drills come with Flexi-coil easy flow headers but can be adapted to other air carts as well. The 40′ models come with a 6 run air pac and the toolbars can be set up with tow between or tow behind air carts. The Pillar toolbars have a rear walking beam that keeps all the transport wheels on the ground. This feature removes the stress on the frame during transport and keeps the toolbar as level as possible in the field. There are walking axles on the transport wheels as well. These features keep an even load on all four corners of the toolbar all the time.